» Do German Shepherds Shed? How Much? 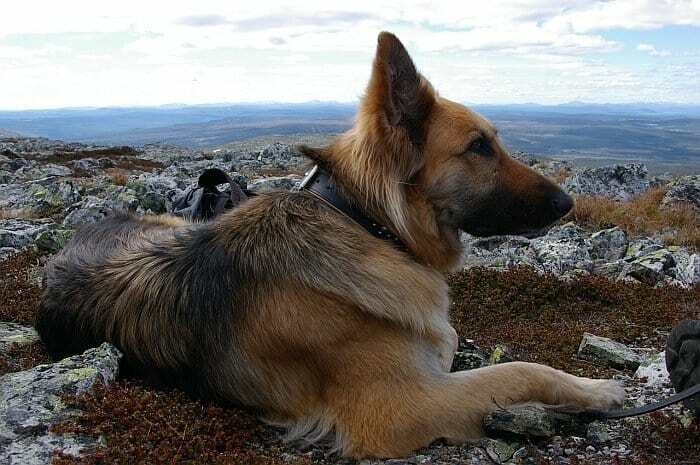 The German Shepherd is the second-most-popular dog in the United States, behind only the Labrador Retriever. They can make great family pets and can be an excellent addition to any home that has the time and energy to meet their needs. Let’s talk about if, when, and how much German Shepherds shed and what you can do to reduce how much fur flies around your house. Yes. German Shepherds shed a little bit all year long, and they “blow” their undercoat anywhere from one to four times per year, when the seasons change. While most of the year, you’ll just see a few hairs left behind when your German Shepherd stands up, a German Shepherd blowing its coat will leave tufts of fur tumbleweeds floating around your home. It’s fair to say that German Shepherds shed a lot. Most of the year, the shedding is manageable with a couple of brush outs per week, but one to four times per year, your German Shepherd will lose all of their undercoat at once. During this time, they may need an hour or more of brushing to remove most of the clumps of fur that are falling out to prevent fur tumbleweeds that can make your home resemble a Wild West town. A professional groomer has additional tools to help remove as much undercoat as possible, like a high-velocity dryer. Used outside, a high-velocity blower can blast massive amounts of undercoat out of your German Shepherd more gently and effectively than any brush. You can learn more tips and tricks for brushing and de-shedding your German Shepherd here. Are There Any Non-Shedding German Shepherds? No, all German Shepherds have a double coat, with a top coat that protects the dog’s skin from the elements and an undercoat that offers extra insulation during certain seasons, then sheds when it isn’t needed anymore. When do German Shepherds Shed? Is there a German Shepherd Shedding Season? German Shepherds shed a little bit all the time, but they will shed more one to four times per year, typically when the seasons change. The biggest shed of the year will usually occur as spring turns into summer, but any season changes can cause your German Shepherd to “blow” their undercoat. Do Some German Shepherd Coat Types Shed More than Others? No, all German Shepherds shed regardless of coat color or length. With that being said, long-haired German Shepherds can become matted when they blow their coat if it isn’t brushed out in a timely manner, so they need more proactive brushing than German Shepherds with the typical shorter coat. The German Shepherd coat involves course outer guard hairs that protect the dog’s skin from the sun, burrs, insects, and other irritants as well as a fluffy undercoat that helps provide insulation during certain seasons and “blows out” after each season. While the course guard hairs shed from time to time, most of the hair that sheds is the fluffy undercoat. Even though you can’t stop your German Shepherd from shedding, there are things you can do to help minimize the impact your German Shepherd’s shedding has on your home. While there is little you can do to reduce the amount of fur that sheds during the seasonal blowout, there are some things you can do to reduce how much your German Shepherd sheds the rest of the year. One of the things you can do is to keep your dog as healthy as possible. One of the best things you can do is to spend a little extra money feeding your dog a higher-quality diet. (Check out our dog food recommendations for large dogs here.) Why? Cheap dog food is the equivalent of junk food for humans. It includes poor-quality ingredients and lots of filler that may keep your dog full but don’t have much nutritional value. If you aren’t already aware of the health problems that people who eat too much junk food can face, check out the documentary “Super Size Me.” Dogs can suffer many of the same health problems, and shedding is one more side effect of eating a low-quality diet. Another way to reduce how much your German Shepherd sheds is to keep them on a flea and tick preventative. Flea infestations can cause intense itching, and the more your German Shepherd scratches themselves, the more loose hair they’ll kick out of their fur and into the air of your home. One overlooked cause of itching in dogs is food allergies. If your vet has ruled out fleas or skin problems, food allergies may be causing your German Shepherd to be itchier than usual. Some ingredients that are more likely to cause allergies in dogs include grains, corn, beef, and chicken. If you suspect that your dog has food allergies, a limited ingredient diet can help you identify which ingredients are causing your dog problems. While there are limited ingredient commercial diets on the market, you might also choose to cook for your dog at home so you can see exactly what ingredients are going into their food. Check out our recommendations on the best homemade dog food recipes here. Did you know that stress can cause shedding? You may have noticed that your hair falls out more when you’re stressed out, and the same can happen to your dog. If your German Shepherd isn’t getting enough exercise or mental stimulation, boredom can lead to stress which can lead to shedding. While nothing beats a long walk or a run at the dog park, interactive dog toys can help keep your German Shepherd entertained when you have to leave them alone. These interactive dog toys can keep your dog’s brain engaged and help reduce boredom and stress. Some health conditions, such as hypothyroidism, can cause excessive shedding. Visiting the vet at least once a year can help catch serious health conditions before they become worse. Not only can this potentially reduce how much your German Shepherd sheds, but it can improve the length and quality of their life. 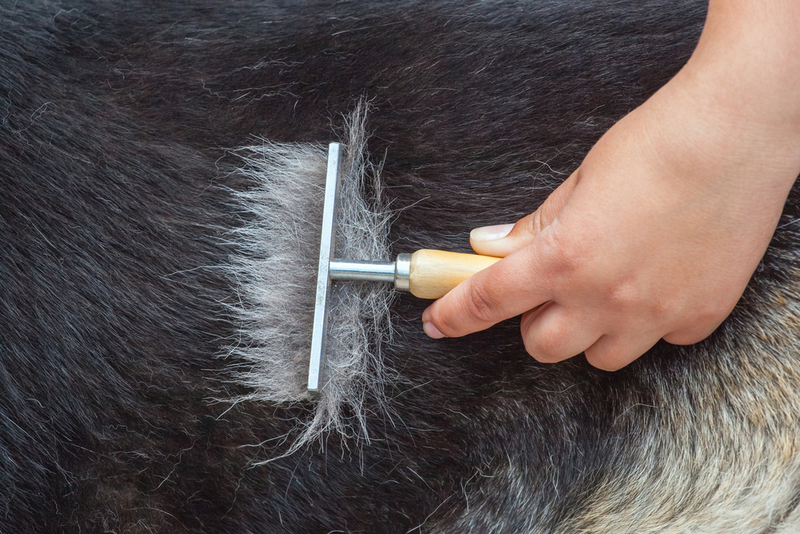 Different tools get out different layers of hair, and overusing certain tools can lead to bald spots, so it’s best to rotate among several different tools to remove the most hair from your German Shepherd with the least chance of irritating their skin. Omega-3 is a fatty acid that helps improve your dog’s skin and coat. While most dog foods claim to include omega-3, it’s often damaged during the cooking process. It’s also important for your dog to get the right ratio of omega-6 to omega-3, and most dog foods are proportionately too high in omega-6. Want to learn more about omega-3 and fish oil supplements? Check out our guide here. One of the best ways to get hair out of your dog without any of it floating around your home is to give them a good bath, especially if you massage them with a rubber curry brush while they’re soaking in shampoo or conditioner. If you wash your German Shepherd in the bathtub, be sure to put a hair trap in the drain to prevent clogging up your plumbing with all the fur you’ll rinse out of your dog. This is especially true if you use a shower attachment to rinse out hair and shampoo better than you can by just dumping water over your dog with a pitcher. One caveat here: washing your German Shepherd more than once a month or so can dry out their skin and cause additional shedding. 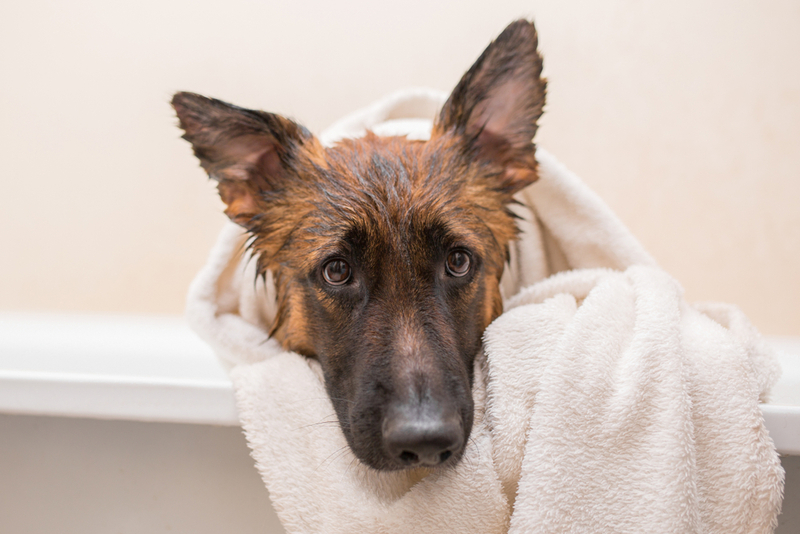 If you feel the need to wash your German Shepherd more than once a month, be sure to use a gentle shampoo along with a conditioner to minimize the risk of drying out your dog’s skin. You may have noticed that your skin starts to dry out if you don’t drink enough water. The same holds true for your German Shepherd, and dry skin can lead to shedding. Make sure your German Shepherd always has access to clean water. If you worry that your dog isn’t getting enough water, you can add moist canned food or certain fruits and vegetables (like cucumbers, bananas, and apple slices without seeds) to their diet to increase their moisture intake. Can I Shave my German Shepherd to Reduce Shedding? When you’re fed up with your German Shepherd’s shedding, it can be tempting to shave them down to reduce how much hair is around your house. This is a very bad idea for a number of reasons. German Shepherds need their fur to protect them from the elements. In addition to opening your dog up to the chance of getting sunburned, shaving a German Shepherd can also increase their risk of having a heat stroke because you’ve taken away one of the methods they use for regulating their temperature. 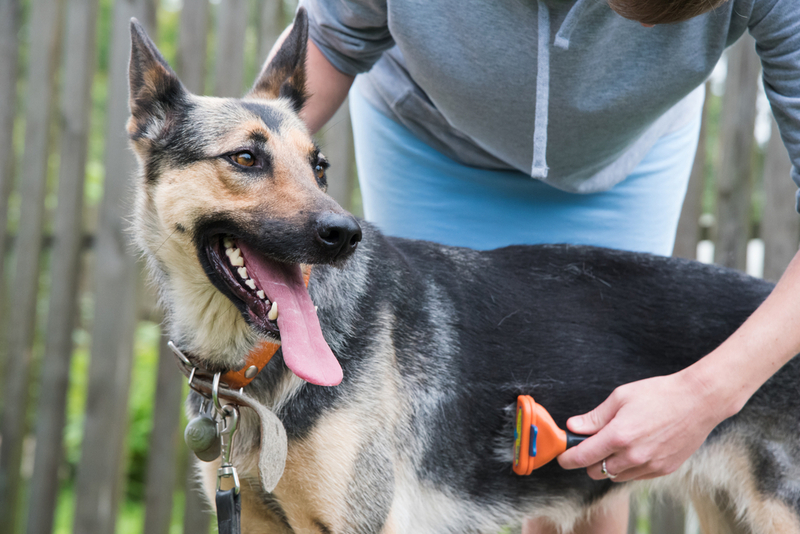 Repeated shaving can damage your German Shepherd’s coat. This is especially true if your dog has or develops certain health conditions. Post-clipping alopecia is a real problem among double-coated dogs and may cause the hair to grow back patchy, cottony, or not at all. Your German Shepherd will still shed; the hairs will just be smaller. While this may seem like a good thing, take it from a former groomer – short hairs cause dog hair splinters more than naturally shed hairs, and those splinters can embed themselves in your clothing and furniture, making it harder to remove them. In short, yes, German Shepherds do shed, but there are things you can do to reduce the impact of their shedding around your home. Unless you absolutely can’t stand the idea of having dog hair in your home, you shouldn’t let their shedding hold you back from bringing a German Shepherd into your home if you think they’re the best breed for your family.